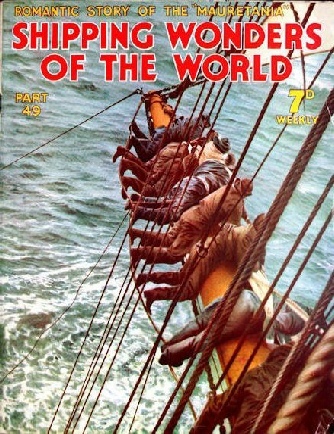 Part 49 of Shipping Wonders of the World was published on Tuesday 12th January 1937. 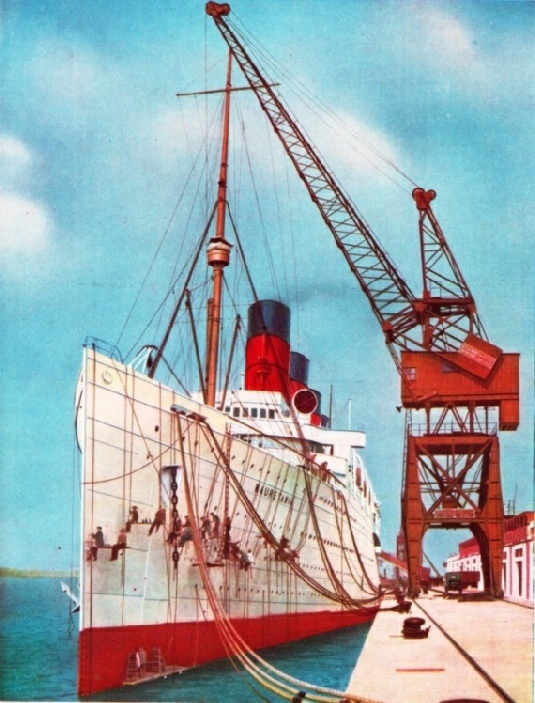 This issue included a colour plate illustrating the Mauretania, as part of the chapter on the Romance of the Mauretania. The plate was attached to page 1549 of this part, and also appeared previously as the cover of part 19. This week’s cover shows a scene on board the Grace Harwar (1,816 tons gross), near Cape Horn, when the hands were on the weather main yard getting the mainsail fast. The account of the provisions for safety at sea by Frank Bowen concluded from part 48. A LINE-THROWING GUN is used in many vessels to enable a line to be got ashore or to another ship when in distress. 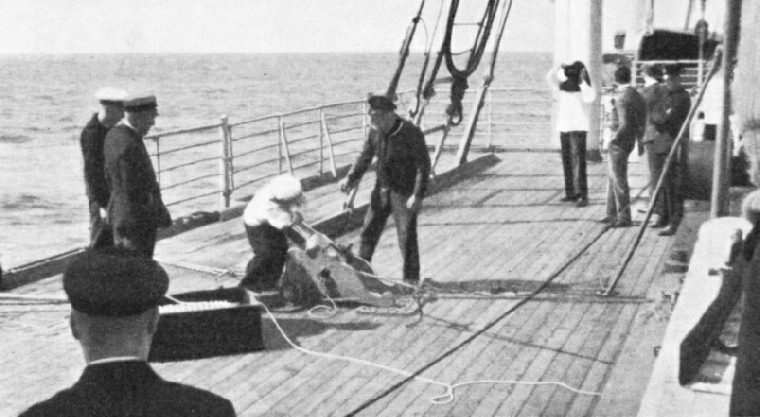 By the Safety Convention of 1929 it was established that every ship must carry an efficient appliance for throwing a line. The appliance may be a rocket pistol or gun, and is often used for getting a line on board another vessel for towing purposes or on to the quay when berthing. Holder of the Blue Riband of the Atlantic for over twenty years, the Cunard liner Mauretania was one of the most remarkable ships ever built. When she was broken up after a long and proud career, her loss was felt keenly by thousands of ship lovers all over the world. The Mauretania deserves a place in this work on two counts. First, the devotion she inspired in those who travelled in her, and secondly, the wonderful achievement of creating an Atlantic record that was unbroken by any other ship for over twenty years. The Mauretania seemed to have a charmed life. She came safely through terrible storms and through nearly three years of war service as a transport and as a hospital ship, and continued in regular service for many years after. Her only serious mishap was a fire in 1921. Even that, however, was a blessing in the end, for while effecting the necessary repairs the Cunard Line took the opportunity of converting the Mauretania into an oil-burning vessel, giving her a new lease of life. The news, in 1934, that she was to be scrapped was a cause of sorrow to thousands, and the auction sales of her furniture and fittings were well attended by souvenir hunters. Many readers will welcome F E Dean’s chapter on the Mauretania. The chapter is illustrated by a fine colour plate, a reproduction of the cover of Part 19. A “COW-CATCHER” MINE-RAKER of the type shown above was fitted to the bows of some British battleships to give added protection against unseen mines. 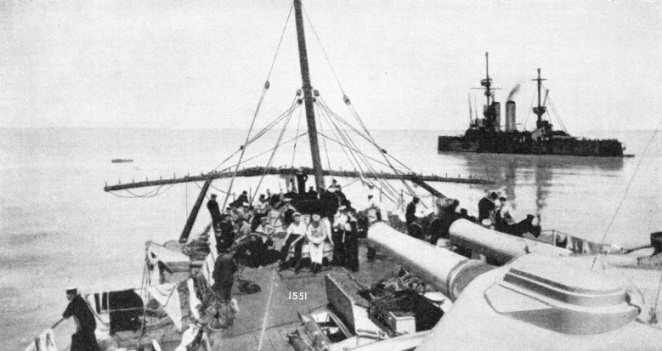 During the battle of the Dardanelles an important part was played by mines, especially by the minefield which was laid by the Turkish steamer Nusrat, under the direction of Colonel Geehl, the Turks’ mine expert. acting airless injection engines developing a total of 900 indicated horse-power, and driving a single -screw through reduction gear and Vulcan hydraulic couplings. On trials the Santa Joana attained a speed of 13.2 knots. The ability to cut out one engine, should necessity arise, makes for economic running at low speeds. In every way the Santa Joana is a most up-to-date and efficient fishing craft. This is the thirty-ninth article in the series on Merchant Ship Types. No historic naval engagement did so much to prove Admiral Mahan’s contention that “ships are unequally matched against forts” as the action in the Dardanelles on March 18, 1915. The persistence of the Nelson tradition (which, incidentally, was the spirit of the Navy long before the time of Nelson himself, as the story of Sir Richard Grenville shows) is admirably illustrated in this chapter. During the battle Commander Verner, of the Inflexible, was seriously wounded. In spite of his injuries her carried on as if unhurt, giving orders with great coolness, and even when carried below with the other wounded, he continued to inquire about his companions, and ask about the progress of the battle. This is but one of the dramatic episodes related by Lieut.-Commander E Keble Chatterton in this chapter. It is not, however, so much the “human side” that we are concerned with in this series on Decisive Naval Actions as the tactics and strategy, the battle of wits, that lie behind the stories of opposing fleets. F E Dean and is the twelfth article in the series on The World’s Largest Ships. DESIGNED AS A DISPATCH VESSEL and built in 1861-65, HMS Helicon became the Admiralty yacht Enchantress in 1885. The Helicon, a sister ship to the Salamis, was given a projecting cutwater, or “plough” bow. 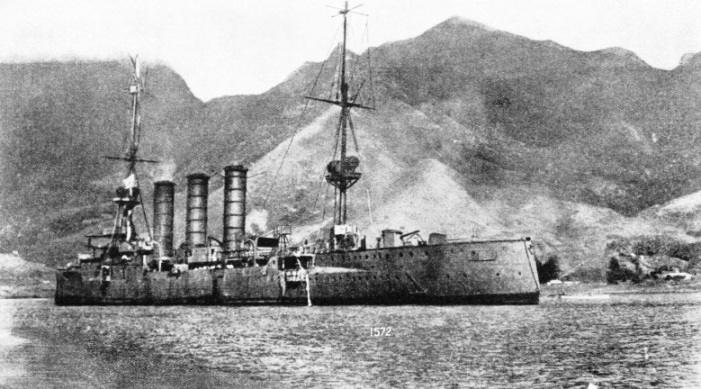 The Salamis retained the more usual form of bow, and proved to be more than one knot slower than her sister ship, which attained a speed of 14½ knots. 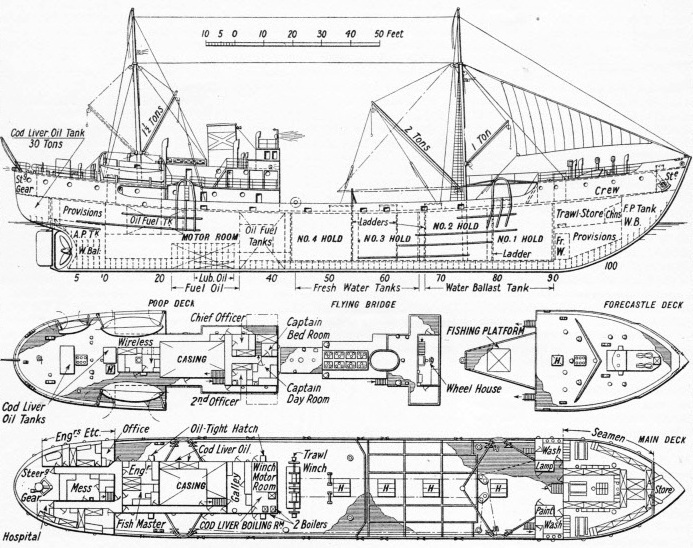 Of 945 tons displacement, HMS Helicon had a length of 220 feet and a beam of 28 ft 3 in. The advantages of having sail as well as an auxiliary engine upon which to rely during a long ocean cruise are well demonstrated by the 18,000-miles voyage of the auxiliary yawl Athene from Los Angeles to Shoreham, Sussex. The Athene belongs to Tay Garnett, the film director, who made a protracted voyage in her to photograph backgrounds of real scenery for some of his films. When the Athene was at Shoreham, Sussex, Sidney Howard paid her a visit, and the result of that visit is this chapter. The Athene is commanded by Captain Harris, a professional sailor, but the crew is composed mainly of amateurs. The story of her 18,000-miles voyage, from San Francisco to Shoreham, Sussex, in just over seven months, is described here. 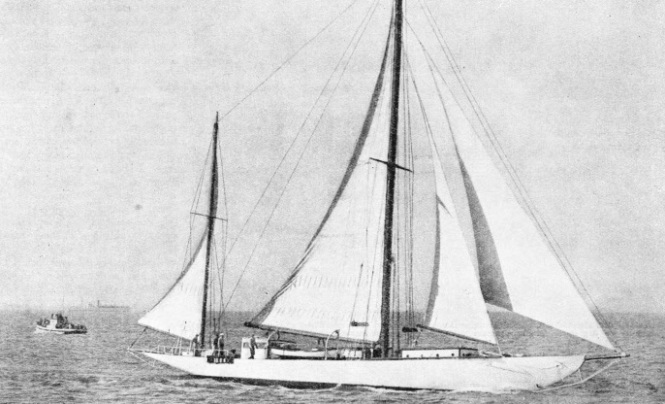 DESIGNED AS A RACING YACHT by Herreshoff in 1899, the Athene is an auxiliary yawl equipped as a floating film laboratory for Tay Garnett, the American film director. The Athene has an overall length of 105 feet and water-line length of 65 feet. Her 50-horse-power diesel drives a propeller on the starboard quarter. The exploits of armed German merchantmen and certain independent cruisers such as the Dresden during the war of 1914-18 - exploits rife with incidents and coincidence - make the story of these raiders more entertaining than fiction. This chapter covers the story of the Dresden, the Kaiser Wilhelm der Grosse and other noted German raiders which gave the British ships a good “run for their money”. This article is by Lieut.-Commander E Keble Chatterton and is concluded in part 50. THE GREAT CUNARDER’S LAST VOYAGE. 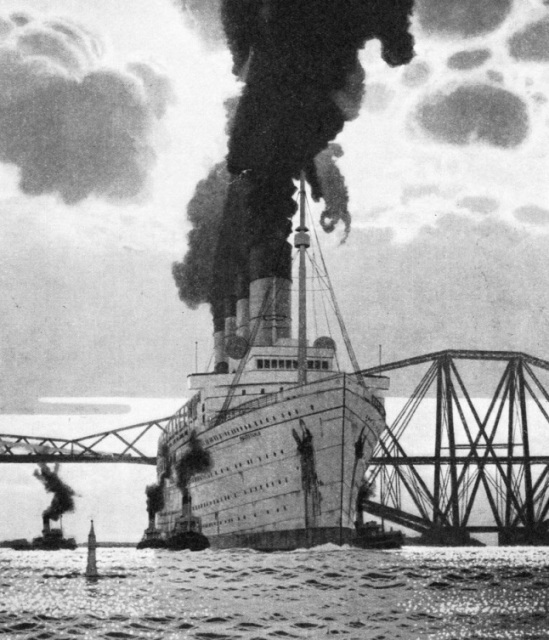 This striking impression of the Mauretania, passing the Forth Bridge on her way to Rosyth to be broken up, is reproduced from the painting by Charles Pears, ROI. The original painting is in the Queen Mary, the vessel which carries on the fine tradition established by the Mauretania. The well-beloved Mauretania left Southampton on her last voyage on July 1, 1934, for Rosyth. DISCOVERED AT A LONELY PACIFIC ISLAND after having escaped detection for more than three months, the German cruiser Dresden flew the white flag at her foremast in surrender. She was caught on March 14, 1915, at the island of Juan Fernandez, having escaped destruction at the battle of the Falklands. She stood high out of the water because she was extremely light, due to her empty bunkers. Her normal draught was 17 ft 9 in.